Born: 5 January 1861, Berlin, Germany. Died: 15 April 1901, Tianjin, China. 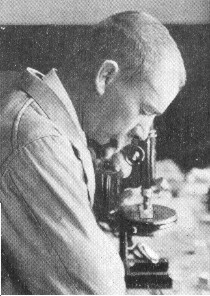 Paul Martin Julius Kohlstock was a sanitary officer and researcher in tropical medicine. He studied medicine at the Friedrich-Wilhelm Institute and qualified as Doctor of Medicine in 1882. His doctoral studies dealt with "Typhus abdominalis" (typhoid fever) in children, a topic on which he published a paper that same year. Having joined the military in 1879 he was promoted to assistant medical officer in 1884. While stationed with the Schutztruppe (regional forces) in German East Africa (now Uganda) he started a study of malaria in 1889. The next year he was promoted to medical officer and married Olga von Livonius. Later he produced a substantial book, Aertzlicher Ratgeber fuer Ostafrika und tropische Malariagegenden (Medical adviser for East Africa and tropical malaria regions), containing advice aimed at travellers, settlers, emigrants, traders and missionaries in the tropics on equipment and the treatment of diseases and injuries. A third edition, revised after his death by Dr Mankiewietz, was published in 1910. During the eighteen-nineties Kohlstock worked for some time under Dr Robert Koch* at the Institute for Infectious Diseases in Berlin, which came to be known as Koch's Institute. On 1 December 1896 he arrived in Cape Town as assistant to Koch, to investigate rinderpest at the request of the Colonial Office. A laboratory was established for them at Kimberley, where they developed a method of immunisation against the disease by means of subcutaneous inoculation with fresh bile derived from diseased animals. During the next two years two million head of cattle were successfully immunised using several variations of this method. However, during this period it was gradually replaced by more effective methods of inoculation with serum. When Kock left for India in March 1897 Kohlstock remained behind and described his further work on rinderpest in a report dated 17 May, which was published in the Agricultural Journal of the Cape of Good Hope later that month, and as Pamphlet No. 9, 1897, by the Cape of Good Hope Department of Agriculture. He developed a variation of Koch's method which consisted of the injection of 0,2 ml of virulent blood two weeks after the inoculation with bile. This came to be known as Kohlstock's method. Kohlstock soon left Kimberley for German South West Africa (now Namibia) to teach Koch's method there. The work at the Kimberley laboratory was continued by W. Kolle* and G. Turner*. Kohlstock worked for some time at the Gammams veterinary experimental station near Windhoek, which had been established in 1895 as a lungsickness station. As a result of his visit the station was expanded and a centre for the production of rinderpest vaccine was established there in 1899. Kohlstock was promoted to chief medical officer and professor in 1898 and remained associated with the Schutztruppe. He continued his studies of malaria, blackwater fever and rinderpest. In 1900 he went with an expeditionary force to China. There he died of typhoid fever at Tientsin (now Tianjin), not far from Beijing. Curson, H.H. South African medical pioneers in veterinary science. South African Medical Journal, 1933, Vol. 7(22), pp. 745-751. Hutcheon, D. Special report on rinderpest in South Africa... from March, 1896 to February, 1897. Cape Town: W.A. Richards, 1897 (Parliamentary Report G.33- 97). Schmidt-Dumont, A. Triumph der Veterinaermedizin. In Becker, K. & Hecker, J. (eds), Vom Schutzgebiet bis Namibia: 1884-1984 (pp. 420-422). Windhoek: Interessengemeinschaft deutschsprachiger Suedwester, 1985.